When a filmmaker revisits the franchise that made his name decades earlier, it’s almost always an act of desperation, like getting hair plugs or buying a Lamborghini. So the news that George Miller was making another “Mad Max” movie, 30 years after the last one (“Mad Max Beyond Thunderdome”) and 34 years after the best (“The Road Warrior”), seemed cause for general alarm. Miller virtually created the post-apocalyptic action genre, but could he make Max matter in 2015? Is it really wise to go back to this future? Oh man, is it ever. “Mad Max: Fury Road” isn’t a reboot, it’s a power-up — an outrageously kinetic, visually inventive, dramatically satisfying demolition derby that pits the matriarchy against the patriarchy while standing as the action film to beat for the rest of the summer, possibly the decade. It may be the best thing Miller has ever done. One of the director’s more daring moves is to start from scratch and dispense with backstories and references to the earlier films; you can walk in not knowing a thing and still have a grand time. Miller also understands that original star Mel Gibson carries too much baggage now to be a convincing Old Max, even were he so inclined. So the great British brooder Tom Hardy has been cast as the hero, a lone and mightily stressed beacon of humanity in a fallen world. Only he’s not so lone this time. About a half hour into “Mad Max: Fury Road,” you may realize with a start that Max is sharing hero duties with a fiery woman warrior named Furiosa, played with tensile strength by Charlize Theron, and that Furiosa may actually be the central figure in this breakneck and emotionally resonant film. Utterly capable while yearning for “the green place” from which she was kidnapped as a child, outfitted with a spidery mechanical arm that is one of Miller’s many nods to that classic movie dystopia “Metropolis,” Furiosa is the movie’s soul and spine. The opening credits sketch in the gas wars that led to the nuclear wars that led to the post-civilization wasteland before us, an arid landscape of devolved city states and marauding bands. (The film was shot in the Namib Desert in the Republic of Namibia.) Max, tormented by the ghosts of the family he couldn’t save, is captured and taken to the Citadel, a tower of rock and massed crowds overseen by Immortan Joe (Hugh Keays-Byrne), a foul power-guru who resembles Jabba the Hutt with an oxygen mask made out of a bear trap. These films all earned four-star reviews from Globe critics Ty Burr, Janice Page, and Peter Keough, as well as former Globe critic Wesley Morris. 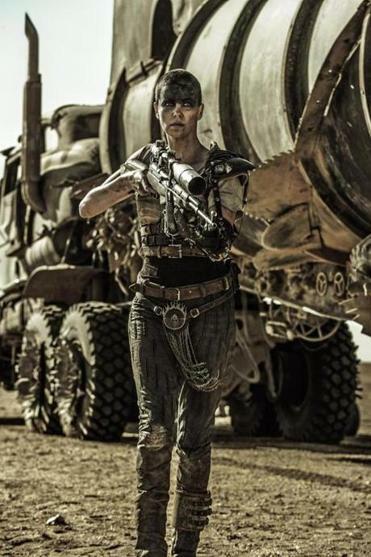 Furiosa appears to be one of Joe’s trusted Imperators, but when she is sent out on a gasoline raid, her tanker truck isn’t empty. Inside are Joe’s precious “breeders” — five women, pregnant and otherwise, making a desperate dash for freedom. Their fashion-model hotness at first seems like a sop to the Maxim crowd, but they’re quickly individuated and a lot tougher than they look (except for one whiner). Max, escaping from the pursuing army, forges a very uneasy alliance with the fugitives. Much of the unholy pleasure of “Mad Max: Fury Road” comes from keeping the story’s multi-level chessboard straight in your head. The movie’s essentially one long chase scene that keeps splitting off in various directions, with the pursuers including Joe and his ’roid-raging son, Rictus Erectus (Nathan Jones), the minions of Gas Town, led by the corpulent People Eater (John Howard), the Bullet Farmer (Richard Carter), and his ordnance-heavy followers. There are biker Aborigines in the canyons, a desert tribe of what appear to be mutant Jawas driving cars like spiny hedgehogs, and ultimately a clan of wise, battle-hardened old women called the Vuvalini, headed by the Valkyrie (Megan Gale). Miller and his co-writers, Brendan McCarthy and Nick Lathouris, have giddy fun with the names, but each and every one is backed up with details that delight or deepen scene by scene. A naively gung-ho War Boy named Nux (Nicholas Hoult) seems like a minor character at the start, but by the film’s final act he’s among the most affecting figures here. All this, and the film never, ever stops moving — well, hardly ever, and the quiet moments feel like oases. While a lot of CGI was involved in painting this derelict future, Miller has made good on his promise to keep most of the action based in real-time stunt work; the movie connects on a visceral level. The action choreography in “Mad Max: Fury Road” is propulsive and astounding, a fusion of production design, editing, high-octane (and often gorgeous) camerawork, and the spectacle of vehicles of insane description bounding around and over each other. Auto junkies, this is your mutant muscle-car Armageddon. Yes, that’s the body of a Plymouth Valiant welded to a tank. Yes, those warriors swaying on tall poles speeding across the desert were hired from Cirque du Soleil for the occasion. For all the mayhem (surprisingly unbloody), “Mad Max: Fury Road” works because it tells a story that feels both fresh and eternal. Miller has given us a new chapter in the age-old tug-of-war between man and woman, conqueror and nurturer — one that is far from didactic and full of gray areas while tapping into current discontents in subtle ways. Indeed, a handful of so-called men’s rights activist websites have contorted themselves into paroxysms of fury over the way Miller has betrayed this great American franchise, no matter that he created it or that he’s Australian. But that’s just another reason to go see it. You’ll notice I haven’t talked too much about Max himself. For a reason — he’s both integral to the action (and the drama) and yet somewhat beside the point. Hardy gives a rock-solid performance that never stoops to showboating: He’s there to serve Miller’s vision the same way Max is there to serve Furiosa’s mission. Hardy and Theron complement each other beautifully, dedicating themselves to hurtling their characters from point A to point B without getting killed, yet allowing Max and Furiosa to grow in almost invisible ways. The shock, really, is how tender “Mad Max: Fury Road” ultimately becomes. The film just wraps that tenderness in one of the most epic action extravaganzas of recent years. It’s enough to renew your faith in movies. Witness it!